Broadway in Chicago has announced that the performance dates for The Color Purple has been reduced from two weeks to one week. We are told the reason is to allow Fantasia, the tour’s star, to also play a week in North Carolina. But could there be another reason? A study by the National Center for Policy Analysis finds that children are overwhelmingly against children’s health services (especially shots….). Lifetime TV has released an official trailer for the upcoming 6th season of “Project Runway.” I can’t wait! Check out this week’s Talk Theatre in Chicago podcast: an entertaining interview with Stacy Flaster, director and choreographer of Footloose, now playing at Theatre at the Center. The Arie Crown Theater welcomes the soulful singing sensation of Fantasia as she reprises her critically acclaimed role of “Celie” in the smash hit musical. The producers of THE COLOR PURPLE are proud to announce that American Idol Season 3 winner Fantasia Barrino will reprise her starring role of Celie for the Chicago engagement. 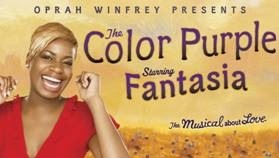 Returning to its debut home of Chicago , THE COLOR PURPLE will make its home at The Arie Crown Theater for two weeks, September 2 –13, 2009. Tickets for performances go on sale May 1 at 10 a.m. and range in price from $49.50 – $85. Tickets are available at the Arie Crown Theater Box Office ( 2301 S. Lake Shore Drive ), online at ticketmaster.com, charge-by-phone at (800) 745-3000 and at all Ticketmaster outlets. Groups of 20 or more should call (312) 791-6320.